ST. PETERSBURG, July 3. /TASS/. Russia’s arms exporter Rosoboronexport intends to fulfill the contract on the supply of the Zubr landing ships to China, Rosoboronexport deputy CEO Igor Sevastyanov told reporters on Friday at the International Maritime Defence Show (IMDS-2015) in St. Petersburg. "The Morye shipyard that designed these Zubr vessels is a Russian plant, so, naturally, the task is to fulfill this contract — the contract that had been signed between Ukraine and the People’s Republic of China," Sevastyanov said. Shipyard Morye specializes in the production of high-speed dynamically supported vessels (hydrofoils, hovercrafts, vessels with air-cavities), boats, pleasure yachts and boats with hull made of aluminium-magnesium alloy. In 2009, Ukraine and China signed an agreement on the supply of four Bizon air-cushioned landing craft (Ukrainian version of the Zubr class ship of the Soviet Project 12322). Two vessels have been delivered to China, and another two were to be built in China with the participation of Ukrainian specialists, according to the contract. In 2014, Crimea where the Morye shipyard is located became part of Russia. The Zubr class vessels are the world’s largest air-cushioned landing craft. The Zubr-class landing craft has a cargo area of 400 square meters (4,300 sq ft) and a fuel capacity of 56 tons. It can carry three main battle tanks (up to 150 tons), or ten armored vehicles with 140 troops (up to 131 tons), or 8 armored personnel carriers of total mass up to 115 tons, or 8 amphibious tanks or up to 500 troops (with 360 troops in the cargo compartment). At full displacement the ship is capable of negotiating up to 5-degree gradients on non-equipped shores and 1.6m-high vertical walls. The Zubr remains seaworthy in conditions up to Sea State 4. The vessel has a cruising speed of 30-40 knots. The development of the Zubr landing craft started in the former Soviet Union in 1978, and the first serial ship joined the Soviet Navy in 1988. There were nine vessels of this class in active service around the world used by Russia, Ukraine and Greece. 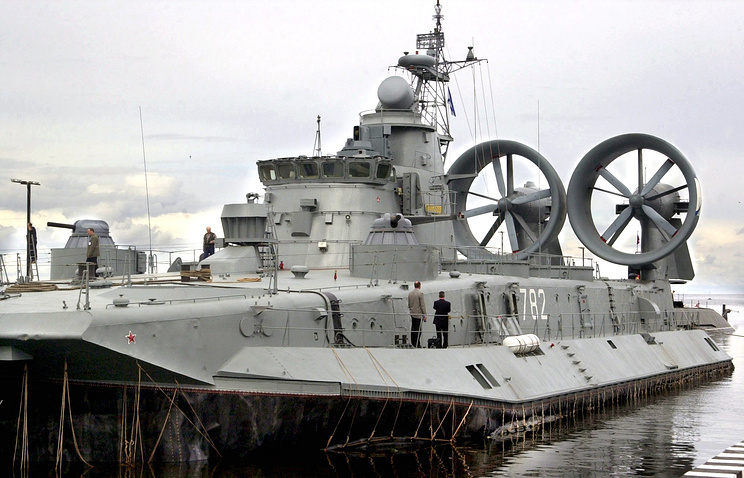 When Greece purchased four Zubr class hovercraft, it was the first time a Russian-built ship was owned by the Navy of a NATO member.